It’s not hard to see that when reading a Cuisinart DCC 2700 review that most consumers find the simplicity of this coffee maker to be ideal for their needs. If you enjoy a hot cup of coffee without the stale taste, this coffee maker’s thermal carafe keeps the coffee at a reasonable temperature for hours after it was originally brewed while maintaining the great flavor of a fresh pot of coffee. Coffee makers with glass carafes usually have a heating element underneath the carafe to keep the coffee warm. After about an hour, this heating element can actually begin to burn the coffee, ruining its rich flavor. This creates waste because if you want a good cup of coffee, you’ll often have to brew a new pot. 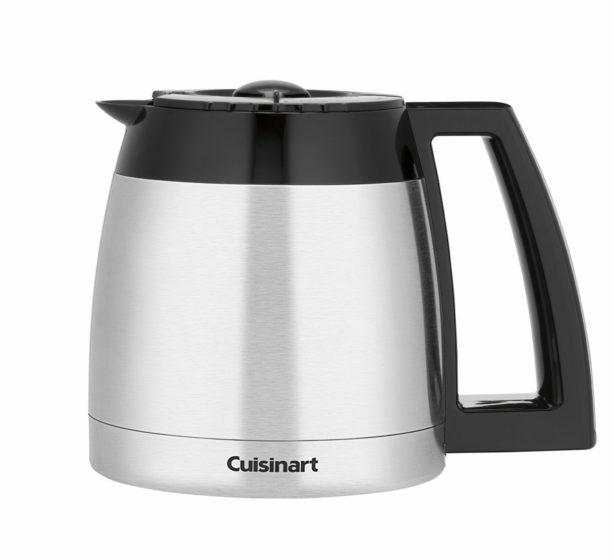 With the Cuisinart, there is no heating element and the coffee retains its warmth from the thermal carafe. The temperature of the coffee is kept at a pleasant level for drinking and won’t be scalding hot. The Cuisinart DCC 2700 is easily programmable to have your coffee ready when you wake up in the morning. There are “bold” or “regular” brew settings depending on your preference. There’s also an audible alert available that will let you know when the pot is done brewing. For convenience, this feature can be turned on or off. Additionally, it also has a 1­4 cup brewing option for those that might only need one or two cups. This helps to eliminate unnecessary waste. The Cuisinart is not only practical but is aesthetically pleasing to the eye and its stainless steel appearance goes nicely with any kitchen décor. In addition, the stainless steel sides are smudge proof, so you won’t notice any fingerprints. The sturdy construction and modern design doesn’t go unnoticed without being an eyesore. All carafes for coffee become stained over time and with the thermal carafe of the Cuisinart, you won’t see the stains as they are hidden inside. Another plus, the Cuisinart doesn’t take up much counter space, so it will fit nicely in most kitchens. Cuisinart got it right when designing this coffee maker. Attractive and versatile, it allows even the toughest coffee critics to get a great cup of coffee with little or no effort. If you’re considering a Cuisinart DCC 2700, review comments made by other Cuisinart buyers and you’ll see that this is the best coffee maker for the coffee lover who doesn’t want to waste time or coffee and still demands great taste.